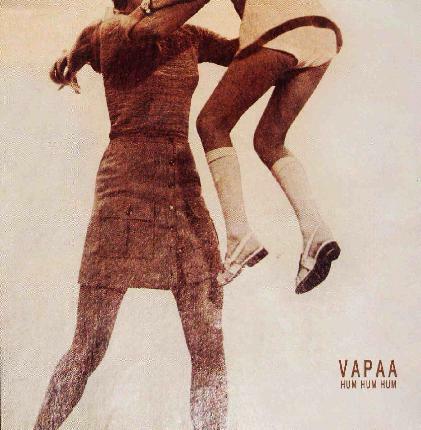 Vapaa is a Finnish free-form improvisational group and they have previously released several CD-R’s on 267-Lattajjaa, Outo etc. Hum Hum Hum is their first CD release, and features only the core members Tiitus Petäjäniemi, J. Koho, Joel Kivelä and Keijo Virtanen. The band members also perform and record as Keijo and The Free Players. For live gigs, they often ask other people to join them. Hum Hum Hum was recorded in 2006 in Jyväskylä, and the album includes five tracks of instrumental, experimental and quite psychedelic and atmospheric music. There are elements of drone, free-folk, jazz and noise in there as well, but the overall feel is quite ambient. The first track “Sarastaa” has soft and hypnotic synth drone, floating guitar and monotonic bass. The long “Varjoista” has peaceful, effected guitar, small-scale rhythm and trippy synth sounds. Later on the drums get a bit more intense and the music goes more into the experimental zone but the track still stays pretty laid-back with delays etc. I like this! “Naky alas” is a great, drone-like sonic collage. The bit weirder “Ajan odotus” has vague beats and clatter as well as lightly chaotic synth and guitar noises but is still quite minimal. The last track “Tuhannet vuodet” is a more laid-back affair with some free-folk elements and synthesizers. Another pretty nice track. All in all, Hum Hum Hum is a very enjoyable, adventurous, but still quite accessible album for those into improvisational ambient music.